There was a noticeable chill in the air this morning as the seasons change and we slip into September... 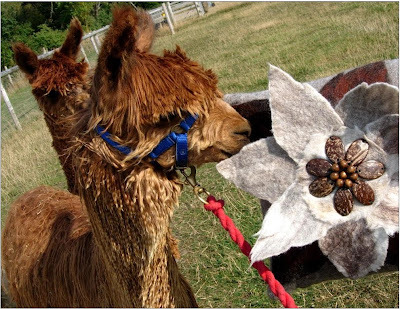 But what a wonderful summer we've had, and a busy one too with lots of new workshops for children & adults at West Wight Alpacas. I simplified the original cushion project decorating the centre piece with beads instead of the cluster of 'shibori' felt balls. 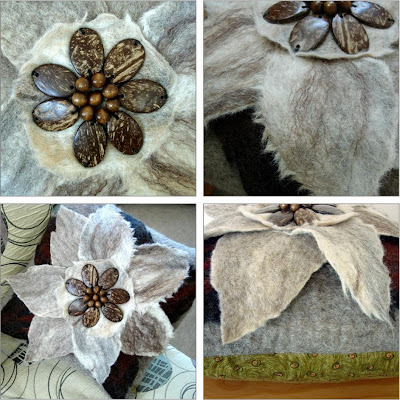 The rest of the flower design was made as before, using layers of pre-felted petal shapes. The dark brown petals were completely felted into the grey background square and the lighter shaded petals were partially needle felted over them to give the 3-D flower effect. Then the beads were stitched onto the grey felt circle. I also hand-stitched through the base of the petals to strengthen the needle-felting, attaching the layers firmly to the felt background as I know the cushion will get plenty of handling! The finished centre piece was placed over the top and stitched to hide the ends of the petals. And you can see it certainly has got Toffee's approval! There's a new programme of workshops planned for this autumn at West Wight Alpacas. 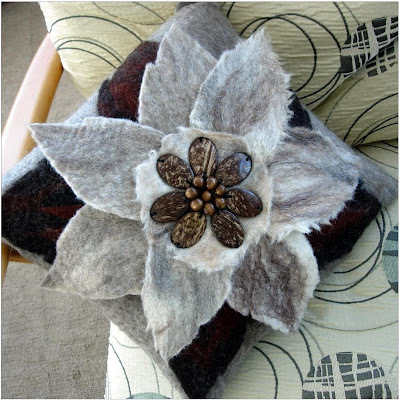 We are including another Felt Cushion workshop, as well as workshops for children during half-term and the Christmas holidays when they can come along and make a special Christmas stocking using alpaca fibre.